What counts for my expedition? For your Expedition section, you will need to plan, train for and complete an unaccompanied, self-reliant expedition with an agreed aim. You must do the correct training for your level and mode of travel, at least one practice expedition, a qualifying expedition (the one that is assessed) and a final presentation in order to complete the section. Your expedition must be completed by your own physical efforts (but you have loads of choices, not just on foot!) with minimal external intervention and without motorised assistance. Your route should also be a continuous journey. The definitive rules can be found in The Handbook for DofE Leaders, and the DofE Expedition Guide available in the DofE Shop. 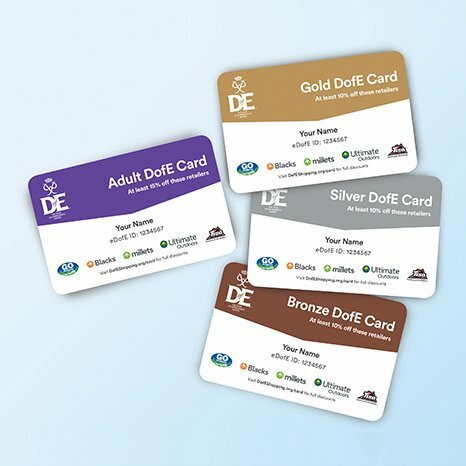 Read the 20 conditions of all DofE expeditions – these must be met for your expedition to qualify for your Award. At Gold your expedition must be in wild country – find out more about wild country and download the forms you need from the expedition downloads page . As long as you’ve completed your training, practice and qualifying expeditions before your 25th birthday you can still achieve an Award. The table below shows the amount of time required for the qualifying expedition for each level. The time associated with overnight accommodation and catering is additional to the minimum daytime hours of planned activity. Preparation – You will need to plan your expedition, including team members, its aim, how you will travel and the environment you’ll travel through. Your Leader and/or Expedition Supervisor will help you to plan this. Use the electronic programme planner in eDofE or download a paper programme planner from the expedition downloads page . Training – You will undertake training in both general expedition skills and your chosen mode of travel. Your Leader and/or Expedition Supervisor will help you to do this. Find out more about training for each level from our expedition downloads page . Practice expedition – You must do as many practice expeditions as you need until you are able to travel safely and complete your qualifying expedition. Qualifying expedition – Once you are fully prepared, you’ll do your qualifying expedition, which will be observed by a DofE-accredited Assessor. Your Leader and/or Expedition Supervisor will help you arrange this. On completion you’ll be debriefed by your Assessor and then prepare and give a presentation of your expedition, which must cover your aim(s), experiences and outcomes. You can give this presentation to your Assessor, your Leader, your Expedition Supervisor or another nominated adult. You can give this in a variety of ways – from a PowerPoint to a drama sketch, an exhibition or an online blog – it’s up to you. Check out our ideas for each category to inspire you! Remember, this is not a set list – you can set up your own expedition as long as it meets the DofE’s requirements and it’s approved by your Leader, Expedition Supervisor, Assessor and Licensed Organisation.